Featuring glass art from more than a dozen artists working in Missouri, Kansas, Oklahoma, Arkansas, Nebraska and Iowa, the third annual Heartland Glass exhibition opens April 5 and continues through May 15 at Monarch Glass Studio. Working from photos presented without any identifying information, a jury selects works purely on aesthetic quality. In the past, local artists such as Vernon Brejcha, Dierk Van Keppel, Patrick Martin and Roberta Eichenberg have exhibited. This year, Tyler Kimball, the artist who created and organizes the show, predicts the finalists will be a mix of professionals, amateurs and students. 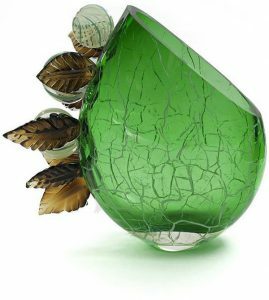 Judges will be looking for works which take glass in bold or unexpected directions, giving viewers a new perspective on an ancient medium. While the technique of blown glass is the one which is most familiar to people, other more esoteric approaches, such as fused glass, in which sheets are joined together via the high heat of a kiln, are likely to make an appearance in the show. The April 5 opening will include a glass-blowing demonstration by Kansas City-based Jonathan Bolivar, who plans to show how to attach elongated string-like pieces of glass, known as canes, to a main component. He will also explain the technique of “Encalmo,” in which one combines two different colored elements of blown glass into one. Tyler Kimball, who founded the Monarch Glass Studio in 2015, has held the exhibit there since establishing the show in 2017. Located in the historic 18th and Vine District, the studio functions as a place to work, hold classes and present exhibitions. Kimball grew up on KC’s West Side and lived and worked as a newspaper reporter in Bozeman, Montana, and Sitka, Alaska, after graduating from the University of Montana. In 2004 he moved to Seattle, where he began making glass art on weekends, but it soon became a full-time obsession. It was there he started making one of his signature pieces, a shuttlecock inspired by the Nelson’s monumental outdoor sculpture. In retrospect, he feels this was a sign that he needed to return to the Midwest; he did so in 2014. Kimball is enthusiastic about the variety of art glass being produced locally and happy to act as its advocate. “The art scene in Kansas City is blowing up,” he explained. “Although there is a lot of diverse artwork, glass has yet to make a mark.” He feels strongly that the city needs a space dedicated to the exhibition and promotion of glass art, not only for artists but for the education and enjoyment of the community. Kimball continues to write, and this spring he will discuss the process involved in creating permanent glass installations for the Glass Art Society Quarterly newsletter. Assuming this year’s Heartland Glass Exhibition follows in the footsteps of the previous shows, the audience will be surprised at the variety and innovation of the works on view. It will be an excellent opportunity to open one’s eyes to the artistry of glass while learning about a 2,000-year-old tradition of artmaking. The Heartland Glass Show opens April 5 and continues through May 15 at Monarch Glass Studio, 1919 E. Truman Rd. Hours are 10 a.m. to 6 p.m. Tuesday, Thursday and Friday and 10 a.m. to 4 p.m. Saturday. For more information, www.monarchglassstudio.com or 816.503.6326. Next Post Good Fortune Follows McAdams, Kansas City Symphony and Chorus, and Soloists in an Exciting "Carmina Burana."